In the week following VIZBI 2018, some of the VIZBI team travel to the New York Genome Center to present a ‘VIZBI Showcase‘. Formerly known as VizbiPlus events, these are evening events designed to highlight the use of visualisation to communicate biological insight and discovery. 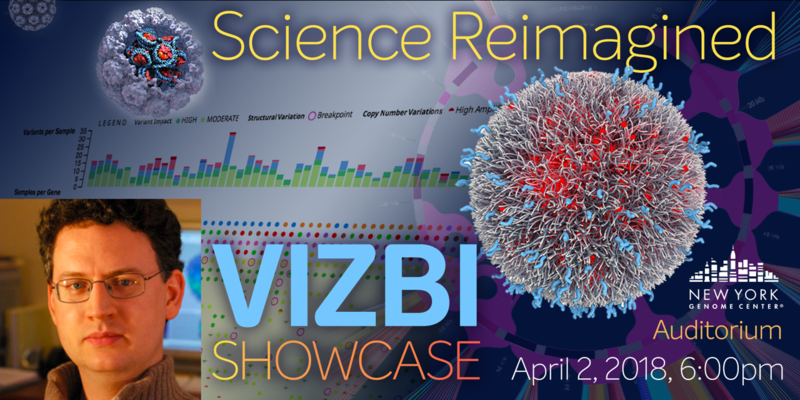 The VIZBI Showcase will be on Monday, April 2, run by local host Christian Stolte, and featuring a keynote from renowned biomedical animator Gaël McGill (Harvard Medical School & Digizyme). This will be followed by short ‘lightning’ talks from local participants whose work spans life science and visual communication. It’s the perfect event to bring friends and family, and share with them the fascinating and exciting world of life science research. The following day, April 3, there will be a smaller version of the Data Visualization Masterclass event, given New Yorkers the opportunity to learn in-depth approaches, techniques, and design issues for visualising complex data. This entry was posted on Saturday, March 17th, 2018 at 06:05.